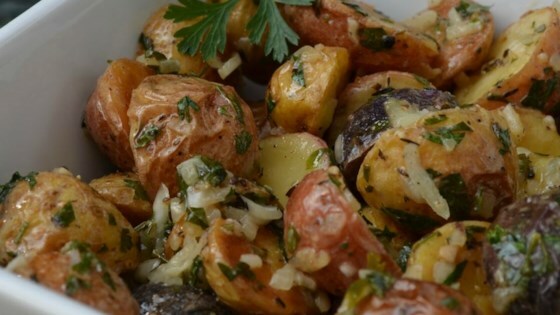 "The Roasted New Potato Salad With Olives exemplifies an amazingly quick - cooking technique. Instead of roasting the potatoes in a preheated oven, start them in a cold oven and roast them as the oven heats. Cooked this way, they brown nearly twice as fast." Toss potatoes in oil with herbs, a generous sprinkling of salt and a few grinds of pepper. Place potatoes, cut side down, in a single layer on a lipped cookie sheet. Set pan on lowest rack of cold oven; heat oven to 450 degrees. Roast until cut side is golden brown and potatoes are tender, 20 to 25 minutes. Transfer potatoes to a large bowl; add olives, onion and parsley. Whisk vinegar, mayonnaise, garlic, a big pinch of salt and a couple of grinds of pepper in a 1-cup glass measuring cup. Slowly whisk in oil, first in droplets, then in a slow, steady stream. Pour dressing over warm salad; toss to coat. Serve at room temperature for best flavor. This recipe is fabulous. It's unlike anything on the pot luck table and everyone who tried it RAVED about it. This is going to be one of my standards.